Is social media helping or hurting our communication? Thanks to Facebook, Twitter, Instagram and the like, we live in a world of infinite and instant connections. 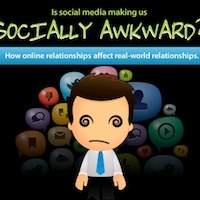 But do social media connections equal fulfilling relationships? We can have 3,000 Facebook friends but no one to hang out with on Friday night. We can post every random thought that flits through our mind but find ourselves utterly tongue-tied when face-to-face with the neighbor from down the hall. Social media has showered us with instantaneous connections across the globe, but is leaving us handicapped when it comes to the art of written and verbal communication in our day-to-day lives. This social media communication disability comes in varying degrees of severity, usually depending upon the generation from which one hails. Those of us whose formative years were in the days before smart phones and 4G, learned our foundational communication skills through letter writing, phone calls and even face-to-face conversations. Our ability to create a hybrid between “To Whom It May Concern” and “LOL” is unique. Teens, and even many in their twenties, currently have a more difficult time bridging the gap – leaning more toward the abbreviated communications of Twitter and texting than a cohesive paragraph with a clear beginning, middle and end. But how does this impact our communication in the different circles in which we must interact: school, work, and social settings? Other than the sometimes fatal dangers of cyber-bullying, social media has impacted today’s classroom on a variety of levels. The fast-food quality of social media communication is taking students down a path that leads them to believe things like “ur,” “btw” and “l8r” are appropriate to use in formal communication. In fact, the entire concept of formal communication has become more foreign than ever. Teachers who have marked down students for using SMS language have found themselves under attack from parents who insist that the teacher had to know what the student meant. On the other side it could be argued that the strictures of social media, especially the 140 character limit of Twitter, is pushing people to boil down their communications to the essence of what they are trying to say. However, except for rare instances where serious writers intentionally use the 140 character limit as a sort of challenge, Twitter is doing more to create a world in which how stylistically you say something is becoming more meaningful than what is actually being said. Nothing has changed the office environment more than the predominance of email. Now, we add texting, Facebook, LinkedIn and Twitter into the mix, and the lines between personal and professional are becoming more blurred by the moment. Not only do employees have to worry about the misinterpretation of an email due to the inability to type inflection and tone, but due to the over-exposed, “TMI” culture of social media, they may also have to worry about being exposed to random blurts of personal information thanks to the disappearing boundaries between what is appropriate to share and what isn’t. In addition, many employers are now checking out potential employees on Facebook and one too many revealing status updates can cost someone a job offer. Social media has eroded the conventions of workplace protocol and created an environment where it is hard for colleagues to distinguish between a status update and an appropriate response to their supervisor. I have a friend who was on a first date and when she got home decided to do a little cyber-stalking of her paramour just to get to know him a little better. 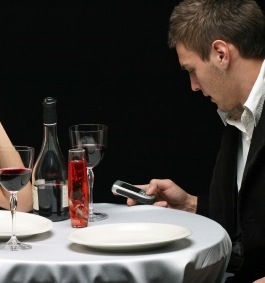 What she didn’t expect was the blow-by-blow of their date that he had been tweeting the entire time. 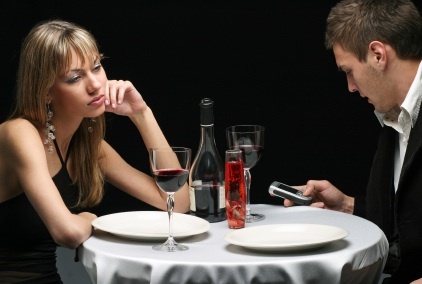 She was humiliated and left with a complete distrust of fellows who refuse to remove their phone from the table during dinner. I’ve also seen lines of teenagers sitting on a sofa texting one another instead of making eye contact and talking. Some families even tweet that dinner’s ready, rather than using their voices and appendages to round one another up. At least they’re sitting down to dinner together, right? Wrong. It’s not unusual to see iPads, phones and even laptop computers join families at the table, effectively taking away any need to actually talk to one another and connect as human beings. Ultimately, the impact of social media has not only created an abbreviated and cavalier language unique to its mediums, but has also established a false sense of community and connection that only adds to the erosion of formal communication conventions. Due to the growing prevalence of isolation wherein people are living more and more in the bubble of their mobile devices while acting out their lives via tweets, status updates and pictures that only show their very best side, personal communication skills are atrophying due to lack of regular use. When he’s not traveling, Porter Olson is a writer and blogger for UsDirect. I agree completely. Social media has made our society less connected, rather than more connected in many ways.